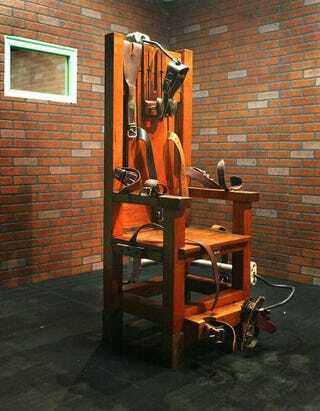 The electric chair nicknamed “Old Sparky,” which stands at the Texas Prison Museum in Huntsville, on Dec. 7, 2002. The chair, in use from 1924 through 1964, was used to execute 361 prisoners. Tennessee Gov. Bill Haslam put his signature on a bill on Thursday that would make the electric chair the legal option for execution if the state is unable to get drugs to administer for the lethal injection, UPI reports. In so doing, he has seemingly found one way of getting around a shortage of drugs available for the lethal cocktail. States have been battling to find the "right" drugs to administer since manufacturers—most of them European companies that are against the death penalty—are increasingly banning the sale of their drugs for the purpose of execution. According to UPI, Tennessee is one of eight states that give death row inmates the option of choosing the electric chair. (In the state, the option is available for inmates who were convicted more than 16 years ago, according to UPI.) However, with the passage of the bill, electrocution would be the only route if drugs cannot be obtained. According to New York's Daily News, a recent Vanderbilt University poll showed that more than 50 percent of Tennesseans approve of electrocution, while almost 40 are against its use in execution. "I had hoped that Governor Haslam would see that this bill is taking us a step backward and veto it," Tennessee Supervising Assistant Public Defender Kelley Henry told NBC News, UPI notes. "It puts Tennessee as an outlier to the rest of the nation." "There are states that allow inmates to choose, but it is a very different matter for a state to impose a method like electrocution," Richard Dieter, executive director of the Death Penalty Information Center, told the Daily News. "No other state has gone so far." Read more at Raw Story and the Daily News.